As frenetic yet organized as my day in Agra was, the next day was the complete opposite. My flight home was scheduled to depart that evening at 8:20pm, so I had the entire day to explore. I had no official tours planned, but there were two places I wanted to visit: Swaminarayan Akshardham and Lotus Temple. Swaminarayan Akshardham is a 100-acre cultural center in New Delhi. The brochure describes it as “a showcase of India’s art, architecture, culture, values and wisdom as a tribute to Bhagwan Swaminarayan (1781-1830 CE), a torchbearer of Indian culture.” It was my first stop of the day and served to open my mind by virtue of three annoyances that were, in truth, cherished blessings. My driver said this casually as we entered the Akshardham parking lot. No way! Surely they must allow cell phone cameras, right? I mean, how would I take pictures of where I’d been so I can show the folks at home? Why would they have built this beautiful temple and not allow people to take pictures of it? The driver must be mistaken! I stuffed my camera into my pocket and marched defiantly to the main gate. Along the way I noticed the occasional grim-faced tourist taking the long walk back to the parking lot, shaking his or her head incredulously. I know that look of regret well, so I decided to stop off at the information booth just to make sure cell phone cameras were okay. Sadly, the attendant there confirmed what the driver had told me, and I became another grim face walking back to the parking lot to stash my phone. It’s a good thing, too. Just before you enter the grounds, you must pass through both a metal detector and what I can best describe as a “thorough” pat-down from security personnel. It turns out they’re pretty serious about this “no camera” thing. My previous day had been spent with a guide in my ear, dutifully filling me with local history and folklore, and lining me up to take or be the subject of what seemed like a million pictures. The Taj Mahal was so majestic, it begged to be photographed, but now, taking pictures was not an option, no matter how beautiful or compelling the subject. I passed through the gates with nothing but my eyes and my mind and you know what? I liked it! As I grow older, I’ve noticed that there are quite a few things about the “young folk” or “these times” that really bug me, and I rather enjoy complaining about them. One of my biggest pet peeves is the penchant people have for taking videos of live events like concerts instead of being present with the experience. It’s difficult to be “in the moment” of an experience and line up the perfect shot to show Aunt Judy back home at the same time. “Can you just put the dang camera down and enjoy the show, for crying out loud!” Another thing I’ve noticed is that I say “for crying out loud” and “for Pete’s sake” a lot more, but that’s not important right now. Anyway, where was I? Oh yes, those dang cameras! Put ’em down people! It turns out that I had become that which I have railed against. Having to be without my camera made me realize just how much of my mind was wrapped up in lining up the perfect picture rather than simply enjoying the experience. This photographic prohibition, as annoying as it was initially, enabled me to experience Akshardham more fully and it had an amazing effect. The Second Annoyance: No shoes allowed. Wait, what? Okay, that really set me off. I don’t know why this is, but I rarely walk around without shoes on. As a matter of fact, I pretty much have shoes on from the time I get out of bed in the morning until I get back into bed at night. I had absolutely no desire to take my shoes off in order to see the rest of the grounds, but it was either that or go home so…off they came! I even went the extra mile and took off my socks! Crazy, I know. The funny thing is, it only took me 10 seconds to realize the blessing this time. The morning was hot and muggy and I already had a good sweat going, but the marble that covered every square inch of the grounds was cool and pleasant to my feet. Each blessed step felt like a tiny blast from an AC unit, and it connected me to the stunning beauty of the temple in a very intimate way. 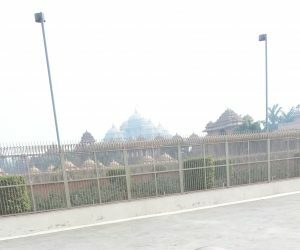 It turns out that Akshardham is a popular destination for school field trips. As I entered the grounds, I was joined by busloads of uniformed precocious children filing in along with their harried teachers and brave parent volunteers. Great, I thought. I’m going to have to deal with kids running around everywhere while I’m trying to quietly enjoy some adult culture. This is going to be terrible! Again, my annoyance was almost immediately replaced with good humor and wonder. The children snaked through the temple grounds in semi-orderly lines and it was a delight seeing them just being ignorant, innocent little kids. Girls holding hands with their besties and boys with their arms flung over the shoulders of their closest comrades, the children took in the sights and, if they were very brave, met the occasional mysterious foreigner. The intricate detail of the main temple is dizzying. From floor to ceiling, ornate carvings in white marble decorate every square inch. I was looking up at one of the nine intricately carved domes, off in my own world of wonder, and when I looked down my eyes were greeted by a smiling little boy, about 10 years old, standing in front of me and patiently waiting to catch my attention. Just beyond him stood his crew, whispering amongst themselves and intently watching our interaction. After a few long moments exchanging smiles, he confidently shot out his hand and said, “Good day, sir.” “Good day to you, young man.” I said, shaking his hand. “How are you today?” His entourage giggled nervously as they looked on. “I’m OK. Good bye.” “Good bye.” I replied, as he returned to his friends a hero. The rest of his class, who were also watching our exchange, passed by emboldened, and greeted me one-by-one with smiles, handshakes, and nervous giggles. It was a delightfully innocent moment that I shall remember always. It was such a blessing to stroll through this incredible temple barefoot, unencumbered by photographic duty, and surrounded by children. Molding my own thoughts and deriving my own meanings, I felt a tangible connection to the meticulously carved sandstone, granite, and marble that enveloped me. I see Akshardham as an homage to both man and God. The abundance of beauty lovingly created by human artisans mirrors the abundant beauty of God’s creation that is ever-present: each molecule, speck of dust, and human being a beautiful work of art loved and cherished by the Divine Artisan. I left Akshardham filled with wonder and appreciation for all existence, from the mundane to the profane. With my eyes and heart wide open, and seeing God everywhere, even within myself, I was ready to make my way to Lotus Temple. There I would be invited to simply speak with the God of my understanding. As it turned out, we had a lot to say to each other. ← WE can do this!